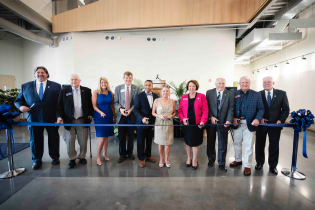 Georgia Southern University’s Statesboro Campus hosted a ribbon-cutting for the new Interdisciplinary Academic Building, a multi-purpose, multi-storied building with state-of-the-art classroom technology, on Sept. 12. 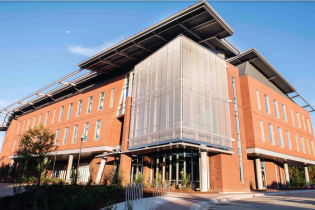 Notably, the multi-purpose building provides flexible learning spaces for students with cutting-edge interactive classrooms and lab spaces for future research. The facility provides opportunities for faculty collaboration across disciplines and houses a wide variety of departments, including interior design, fashion merchandising and apparel design, as well as history, foreign languages, writing and linguistics, international studies and departments in the Waters College of Health Professions. In 2015, Georgia Gov. Nathan Deal included $33.6 million in funding for the new classroom building in the state’s 2016 fiscal year budget. Construction was completed by Charles Perry Partners Inc. (CPPI), in partnership with Lavender & Associates, and architectural design by Hellmuth, Obata, Kassabaum (HOK).